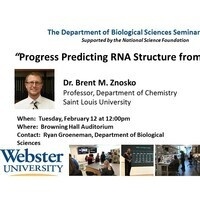 The College of Arts & Sciences, Webster University Biological Sciences Seminar Series, which is supported by National Science Foundation (NSF) is welcoming Dr. Brent Znosko from St. Louis University to discuss his work, "Progress Predicting RNA Structure from Sequence". Join the Biological Sciences department at 11 for a meet-and-great with Dr. Znosko. Refreshments will be provided. Browning Hall/ISB - Room 140.